If you don't have kids and pets that need a big lawn to play on, there are many good reasons to cut down on the amount of grass in your yard. Keeping a lawn in good condition requires regular mowing, watering and fertilizing, which all consume natural resources - in other words, reducing grass is a great way to contribute to a more sustainable planet. There are many alternatives to choose from that are both functional and aesthetically pleasing. Consider adding plants other than traditional grass to reduce the lawn's size. 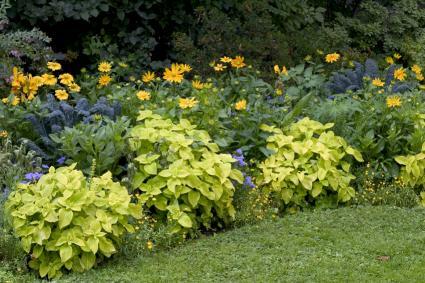 The corners and edges of the lawn are a great place to reduce its size and replace it with colorful annuals. Focusing on the areas with the highest visibility, till up the grass, form a gently sloped mound of soil enriched with compost and plant a seasonal rotation of your favorite flowers. 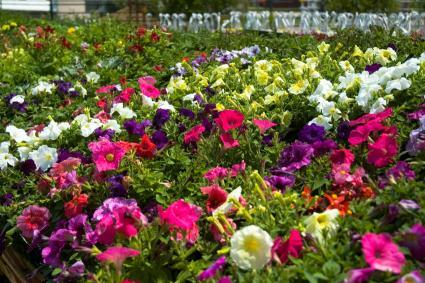 This option is very rewarding in terms of color and visual interest, but regular maintenance and replanting to succeed. Locations with full sun are the best choice for converting lawn grass to an an annual flower bed. While annual flowers are a great choice for the areas closest to paths, patios and entryways where they can be enjoyed up close, larger perennial species are a complementary choice for the far sides of the lawn where the swaths of color and texture can be enjoyed from a distance. The maintenance required is much less than for annuals - cutting back the flower stalks once or twice a year is usually sufficient. 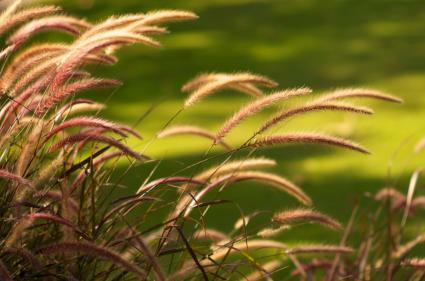 Also, there are many shade-loving perennials that give options for reducing grass in areas without full sun. Large scale groundcover plantings are a low maintenance alternative for lawns. Many offer colorful foliage, seasonal flower displays or interesting textures. There are varieties for shady areas, as well, providing options for replacing a lawn that is failing due to lack of sunlight. Groundcovers are a suitable choice when you want to eliminate the lawn entirely, as they tend to have a uniform appearance that is appealing when repeated over a large area. 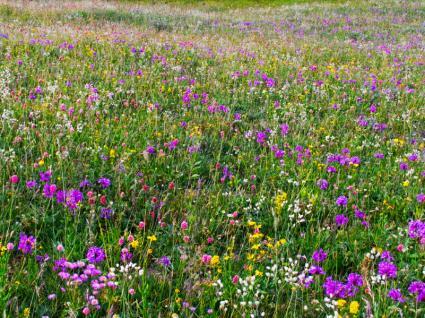 Direct seeding a mixture of native wildflowers is another option for replacing grass. This is especially effective on large rural properties where the semi-wild appearance of a meadow is a good fit with the naturalized landscape. The key is finding the species that are best adapted to the climate and soils where you live. 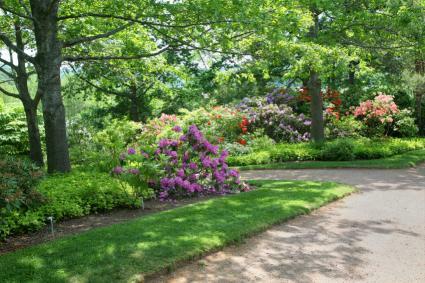 After they are established, little is needed in the way of maintenance other than an annual mowing. Conventional lawn species are only the tip of the iceberg when it comes to the world of grasses. 'Bunchgrasses' which have a taller, clumping habit - and require no mowing - range from 6 inches to 10 feet in height and come in an astonishing range of color, from blue-grey to purple, pink and shades of orange. Like the groundcover option, these are suitable for repeating over a large area, where they blend into a continuous mass of plush foliage and soft seedstalks that sway in the breeze. A sunny lawn has its positive attributes, but so does a shady yard that helps to keep the house cool. Planting trees with an assortment of shrubs, perennials and groundcovers around them, with an eye towards how it will evolve into a full grown forest, is a forward-thinking approach that will create a one-of-a-kind landscape in the long run. It is a major investment in time and energy to create, and requires a great deal of patience before the effort pays off, but the results can be spectacular. Of course, if you already have mature trees with grass struggling to grow underneath, you can simply add layers of understory plantings beneath the canopy. 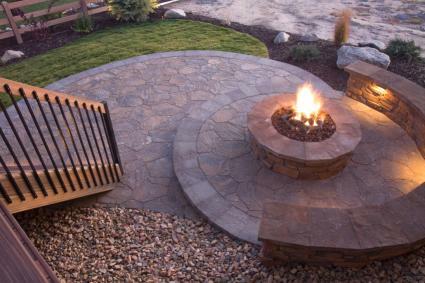 Patios, decks and paved areas - known collectively as the hardscape - are another approach to eliminating grass. These construction projects can really add to the value of the home and create a lot more usable outdoor space. Though costly to install, there is little maintenance required compared to plantings. In the backyard, convert part of the lawn adjacent to the house to an outdoor entertaining area with pavers, flagstone, stamped concrete or old-fashioned bricks. If created with an interesting, artistic shape (as opposed to a simple rectangle), a patio makes a pleasing transition between the home and the outdoor landscape. If you have too much lawn and not enough parking, consider a conversion. This doesn't have to mean adding concrete, either. Using a decorative type of gravel or ornamental pavers can create a gentle transition between the existing driveway and planted areas, increasing the overall appearance of the property. 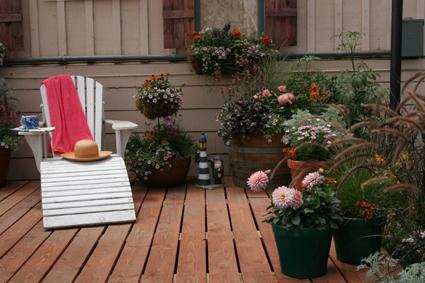 An elevated deck fulfills the same function as a patio, but is a better choice where the back door is well above ground level. Wood that is stained or sealed to protect it from the elements is the most conventional choice of materials, but there are also highly attractive synthetic boards made from recycled plastic that are extremely long-lasting and never need to be resealed. Perhaps the simplest, most cost-effective method for eliminating grass is to cover it with heavy duty landscape fabric and put down a thick layer of mulch. This creates an instant, low maintenance landscape that can later be planted with something other than grass or converted to hardscape. If any weeds appear, be sure to pull them right away before they become established. As a biodegradable substance, mulch slowly disappears and must be topped off every couple of years. When converting a lawn, it is important to take steps to ensure that it does not return in places where it is not wanted - in the middle of a flower bed, for example. To be completely sure, rent a sod cutter to slice under the entire layer of turf and make sure that all remnants of roots and rhizomes are removed. If converting to another type of planting, you'll need to loosen the compacted soil that remains where the turf once was (whether by hand or with a tiller) and add a generous quantity of compost before replanting to recreate the topsoil that was removed with the grass. If converting a lawn to any type of hardscape, it may be necessary to remove additional soil below the level of the turf so the patio or paving can be constructed on firm, compacted subsoil, ensuring that it won't settle and slump over time. Lawns have some aesthetic value, but require a lot of effort to keep it. 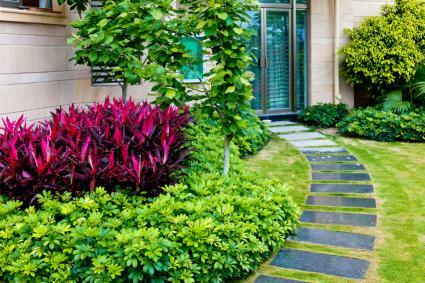 By replacing all or part of a lawn with a more diverse planting, the yard will begin to come alive and begin to feel more like a garden, rather than a sterile landscape. Functional hardscapes, if tastefully designed, also add an aesthetic dimension to the property and have a major effect on property value.